The memorial to James Ewing of Strathleven Portrait of James Ewing MP, LLD by John Graham Gilbert, shown here by kind permission of the Merchants House of Glasgow. The memorial to James Ewing of Strathleven is only a few feet away from and on the south side of the base of the John Knox memorial. In fact there is no other memorial so close to John Knox. This is of great significance in recognition of his involvement in the creation of Glasgow Necropolis and the immense influence he had in Glasgow. His life was very much wrapped up in the commercial development of Glasgow at a time of tremendous growth in population and business. There is no doubt that his contribution to Glasgow was considerable with his enormous interest and effort in both public affairs and what became his substantial commercial interests. James Ewing was born on 7th December, 1775, 5th child of Walter Ewing Maclae 3rd of Cathkin & his wife Margaret Fisher (the name Maclae was added when he inherited Cathkin House and estate at Cathkin House, south of Glasgow). He was named after his maternal grandfather, the Rev James Fisher. After some years of education at the High School of Glasgow, James Ewing went to the University of Glasgow in 1787 at the age of 12, where he read classics, literature and philosophy. It had been expected that James Ewing would become a lawyer, and be called to the Bar, however this was not to be. James Ewing became an agent in Glasgow for the imports from the sugar plantations in Jamaica and built the business from scratch under the name James Ewing & Co and the business grew at an unexpectedly fast rate. James had originally worked with his father, Walter Ewing Maclae, a well known Arbitrator and experienced accountant. So James was given good training in accountancy and his father’s business was eventually merged into James Ewing & Co. In 1809 James Dennistoun of Golfhill, with support from James Ewing, founded the Glasgow Bank. James Ewing, James Dennistoun, and Robert Dalgliesh were partners, great friends and colleagues. In 1814 James’ father, Walter Ewing Maclae, 3rd of Cathkin died leaving Cathkin House in life rent to James’ mother, Margaret His heir, Humphrey Ewing 4th of Cathkin, was in Jamaica and Margaret did not enjoy living there on her own, and moved to Totness in south Devon. In 1815 in the hope of enticing his mother back to Glasgow, he purchased the mansion known as ‘Glasgow House’. The house was considered the most handsome residence in the whole of Glasgow, for which James paid £3,000 (£108,600 in 2003 terms), a very large sum for a house at that time.The house was situated where Queen Street Station is now situated adjacent to George Square. In June 1815, at the age of 40, James Ewing and Archibald Smith of Jordonhill established the first ‘Provident’ or ‘Savings’ Bank in Glasgow. It was set up to support and encourage the ‘lower orders’ of hard labouring and industrious families of the community where deposits of one shilling and above could be made, thus encouraging the habit of ‘ saving’, which became such a characteristic of the Scottish population right up to the second world war. Archibald Smith was the first Governor, and James Ewing was Deputy-Governor. The bank spread to many towns and villages in the west of Scotland. James Ewing was appointed Dean of Guild of The Merchants’ House of Glasgow, an office only bestowed on persons of the highest position inthe city. The position of Dean of Guild had important, extensive,influential and time consuming functions including the automatic appointment as a member of the City Magistracy Council. He habitually endeavoured to advance the national interest of the country. “This was always carried out in the best interest of all classes”. James Ewing was also appointed Convenor of the Committee of the City Council for conducting the affairs of the High School of Glasgow. Under his convenorship, new departments for writing and arithmetic were added, both subjects being considered advantageous for the rapid growth and commercial appetite of Glasgow. He later donated a considerable gift of money to the Council to provide a silver medal to be awarded annually to the pupil producing the best progress in the knowledge of the Greek language and for the purchase of books which formed the nucleus of the school library. He continued as Dean of Guild of the Merchants’ House and wrote a history of the Merchants’ House from its inception in 1605 to 1816. James Ewing was appointed President of the Andersonian University, an Institution encouraging “the diffusion of literacy, and scientific knowledge among the classes of its citizens who were, by their circumstances and avocations, precluded from becoming regular students within the University classes”. [Anderson University later became Strathclyde University]. He was also appointed:- Chairman of Glasgow Marine Society, Director of Glasgow Auxiliary Bible Society, Director of Magdalen Hospital and Director of Glasgow Lunatic Asylum. All these tasks he undertook with considerable vigour in addition to his various business interests. He was appointed Chairman of the Glasgow Chamber of Commerce for 1818 & 1819. Another of his notable campaigns was to obtain the repeal of the Test and Corporation Acts. While these Acts were more applicable to England, in Scotland, the swearing of the ‘Burgess Oath’ was a necessary qualification for Civic office or honour and even many other employments. The Oath required all to acquiesce in the then existent condition of all civil and ecclesiastical matters. This resulted in many ecclesiastical non-conformists either being barred from office or having to be prepared to take the Oath despite their true beliefs. The Lord Provost, Magistrates & Council of Glasgow appointed a committee of their members to draw up a report on the whole question. James Ewing was appointed Convenor of the committee and he corresponded on the subject with every Royal Burgh in Scotland. Finally he completed a very elaborate report. In 1819 the Magistrates and Council of the City of Glasgow adopted the report . 1820 was another year of political discontent – the so called ‘Radical War’. In the Glasgow area there were riots which were considered to have constituted a rebellion. On the 20th July James Wilson, a Strathaven weaver, was charged with High Treason at the Court of the Assize. James Ewing was not only chosen to be a Jury member, but was appointed Chancellor of the Jury and it therefore fell on him to pronounce the Jury’s guilty verdict at the end of the two day trial. James Ewing recommended the prisoner to the mercy of the Crown. This was to no avail and James Wilson was publicly hung and then beheaded. James Ewing was invited to be Lord Provost of Glasgow but declined. At this stage of his career he was making huge efforts to improve and reform the public institutions in Glasgow; in particular Brideswell, the prison which had been built in 1799, the Town’s Hospital [the original poor-house of Glasgow, built in Clyde St in 1733], and the city infirmary (the Royal Infirmary). After many years of interest in prison improvement, James Ewing had been appointed Convenor of a Council committee to consider all these matters in 1819 and to report by 1822. Only in 1814, with the encouragement of James Ewing and others, were female warders introduced to look after female prisoners. The first Bridewell was a very small building erected in 1799, and from want of sufficient accommodation, it frequently happened that as many as six, eight, and even ten individuals were chained together in the same cell, eight feet by seven [2.44 x 2.13 m], ill ventilated, and ill-furnished. The old and the young were mixed together – the hardened with the most vulnerable. James Ewing met considerable opposition to his suggestion to build this large new prison, and he had to make several visits to London, at his own expense, before the County & City Brideswell Bill was finally passed through Parliament in July 1822. James Ewing put forward a resolution recommending the lighting of the court-yards and lobbies of the jail be lit with Gas. The work of the committee regarding the Town’s Hospital seems to have been undertaken almost entirely by James Ewing ending with a 500 page report which was finally reduced to 220 octavo printed pages. Ewing by the then current rules of the Council, had to resign from the Council for at least one year, having served for six years. At the suggestion of Rev Dr Stevenson MacGill, Professor of Theology in the University of Glasgow, James Ewing threw himself into the creation of a statue of the Scottish reformer, John Knox at the uppermost point of Fir Park. This was the first statue of John Knox to have been erected in Scotland and its building created enormous interest. 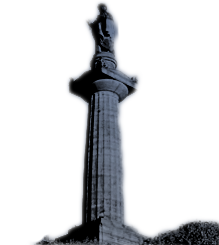 (For more information on this see our Profile The John Knox Statue. In 1826 James Ewing was conferred with an Honorary degree of Doctor of Law by Glasgow University, a rare honour at that time. The following year he lead the creation and building the Royal Exchange building in Exchange Place, Glasgow. He was the largest single subscriber, among several influential merchants, to the building costs and was elected by the Proprietors as Chairman of the General Committee. He was given the honour of laying the foundation stone of this magnificent building which became the centre of trade in Glasgow. The Royal Exchange was particularly used for meetings in connection with the sale and export of coal and steel. Shipping arrangements for almost all the Lanarkshire coalfields was made through the Exchange in those earlier days. The building has become Glasgow’s Gallery of Modern Art (GOMA). In 1828 James Ewing presented Glasgow University with £100 (£4,422 in 2003 terms) to purchase the Ewing Gold Medal, to be presented every second year for the best essay on a prescribed historical subject, alternately in medieval and modern history. The James Ewing Entrance Burseries to Glasgow University were founded in 1879 out of his legacy of £10,000 (equivalent to £560,900 in 2003) for “educating, training, and settling in business the sons of decayed Glasgow merchants”. There were at that time many ‘decayed’ Glasgow merchants who had lost their American tobacco plantations as a result of the American War of Independence. With the death of King George IV in 1830 , Parliament was dissolved, and James Ewing, still being Lord Provost,, was encouraged to stand for Parliament as member for Glasgow, Rutherglen, Renfrew and Dumbarton. Archibald Campbell of Blytheswood, was the sitting MP. Kirkman Finlay of Toward, had been MP (or Representative in Parliament, as they were called then) from 1812 – 1819 and had received the full support and backing of James Ewing. So when Ewing heard that Kirkman Finlay had decided to stand again he stood down. James Ewing was reappointed Dean of Guild of the Merchants House, in 1831. The Scottish Reform Bill was passed in 1832. A new speed record between London and Glasgow of 35 hours and 50 minutes was set by a journalist reporting the result of the voting on the Reform Act in the House of Lords. The normal speed was 44 hours for a coach and four horses being used with 45 changes of horses (180 horses) In the last unreformed Town Council he was appointed Lord Provost of Glasgow and was the last Lord Provost to wear the prescribed court dress of velvet coat, dress sword, hair tied back in a black silk bag with lower habiliments and sparkling shoe buckles. In the same year, in the first reformed Parliamentary election he was appointed as one of two M.Ps. for Glasgow. Six candidates stood, with James Ewing as an Independent. James Ewing continued as MP for Glasgow, but on completion of his term as Lord Provost, he left the City Chambers and never returned to the building again. He laid the foundation stone for the building of the Jamaica Street Bridge over the River Clyde. In the year of James Ewing’s 60th birthday Parliament was dissolved when the Whig majority, under Lord Melbourne called on King William IV. The Duke of Wellington attempted to hold Parliament, but he was insufficiently Reformist, Parliament was dissolved, and another election called. James Ewing stood again, as an Independent, but failed to be re-elected, and that was the end of both his political and public life. James Ewing then bought the house and estate of Levenside, near Dumbarton for ëupwards of £110,000 Sterling’ (£5,683,700 in 2003 terms). The house was in a considerable disrepair, having been let to several tenants in the previous years. He threw all his energy into repairing and improving the house and estate and using the experience he had gained from his upbringing at Cathkin House and estate and changed the name to Strathleven House. In 1836 James Ewing (61years old), married Jane Tucker Crawford, the 23 year old daughter of James Crawford who had been connected with Crawford, Tucker & Co of Port Glasgow, one of the largest businesses on the Clyde. They had no children. In 1838 Glasgow House was sold by James Ewing, for £35,000 (£1,579,550 in 2003 terms) to the Edinburgh and Glasgow Railway Co, who built Queen Street station on the ground after demolishing the house. In 1844 James and Jane Ewing, together with her ladies maid, set off on a 13 month tour of the Continent, keeping in touch with his business partner in James Ewing & Co, William Mathieson, in Glasgow by very regular letters. These letters were very numerous and give an extremely full and interesting account of their journey and observations of people, manufacturing, agriculture and local history. They are far too many to copy, but may be read in full in the Rev Dr Mackay’s ëMemoir of J Ewing of Strathleven’, James Ewing died in his George St, Glasgow town house on 29th November in his 79th year in 1853. His nephew, Humphry Ewing Crum, changed his name to Humphry Ewing Crum Ewing (1802 – 1887) when he inherited the business of James Ewing & Co, the estates in Jamaica and St Kitts and the House and estate of Strathleven. James Ewing’s widow had life rent of Strathleven House, and outlived Humphry Crum Ewing who rented Ardencaple Castle, Helensburgh, Dunbartonshire. In James Ewing’s “History of the merchant’s House’, he states that ëthe primary object of the Merchant’s House, was the charity to its reduced members and their families” and “it appears that the objects for which the annual rent of these mortifications was destined, divided themselves into three classes – first, for the support of the poor of different descriptions, secondly, for the payment of apprentice fees to destitute boys, and thirdly, for the education of young men at university”. The Royal Scottish Academy of Music and Drama. Other public bequests were made to many churches and hospitals totalling nearly £2m in 2003 terms. Founding father of the Necropolis and normally described as a West India merchant. In fact Ewing was a substantial slave owner, although an absentee, on the Island of Jamaica. The Legacies of British slave-ownership database found at https://www.ucl.ac.uk/lbs/person/view/21020 gives a snapshot of his position at the abolition of slavery in the British colonies in 1834. Between February 1836 and October 1837 he and his partner in J. Ewing & Co., William Mathieson, claimed for a minimum of 586 persons enslaved on 5 plantations in Jamaica and received a total of £9328 8s 10d from the British government in compensation. Note that as this database is only concerned with the position at the very end of slavery in the British colonies it does not shed any light on any previous ownership of slaves. Note also that Ewing purchased Strathleven in 1836 just about the time he was receiving this windfall from the British government.